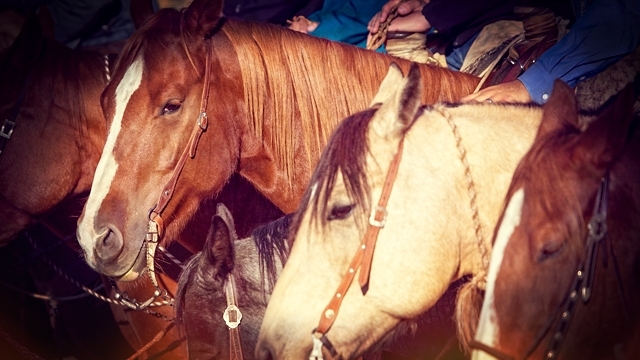 The ninth annual Top of the West Horse Sale took place on Saturday, April 11, 2015 at Copper Spring Ranch near Bozeman, Montana (www.copperspringranch.com). 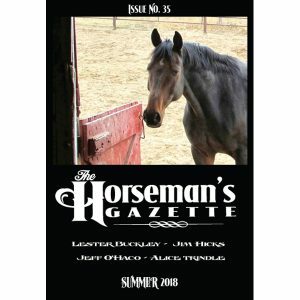 Last year, 30+ young horses were in the sale. Horses from both Montana State University (MSU) and University of Montana Western (UMW) were provided for the sale, which is a fundraiser for the unique equine studies programs at both schools. 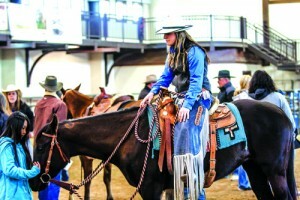 Donated horses—mostly registered three-year-old American Quarter Horse fillies and geldings—trained by students as part of their school work made up the sale. To highlight the work the students have done and to provide a preview of the sale horses, a competition was held the day before the auction. Clinician Buck Brannaman taught a clinic for the MSU students and the horses that were to be in the Top of the West Horse Sale in January before the sale last year. Buck’s daughter, Reata, is the instructor of the Colt Starting Class at MSU. 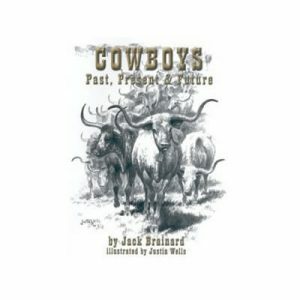 In my colt classes I’m all about people getting really good at their groundwork, getting those horses gentled,” Buck says. 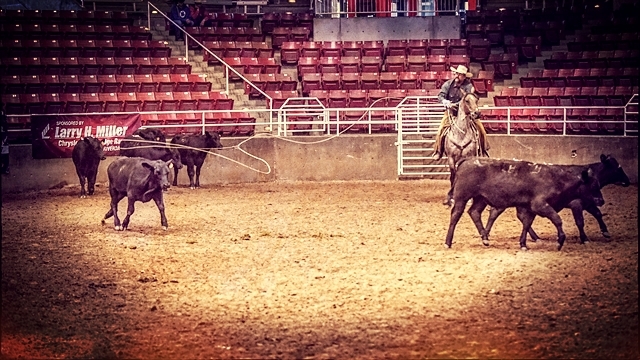 “A lot of times, it’s more like people do the minimum—but man, those kids, they had those horses gentle when I got there. They were able to lope around and pass a tarp back and forth to each other. You couldn’t hardly come up with something that the horses were bothered about or afraid of. 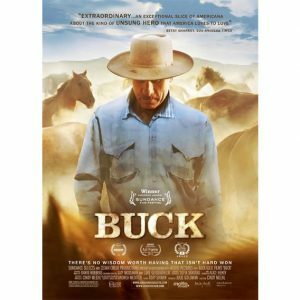 Ray used to tell me when I was younger and riding horses for the public, he’d say, ‘Buck, you get those horses gentle. You don’t worry too much about putting a handle on them, but get them gentle. Then, try to get them handy.’ And yet, they had them handy, too. “They were going good. I really had something to work with. 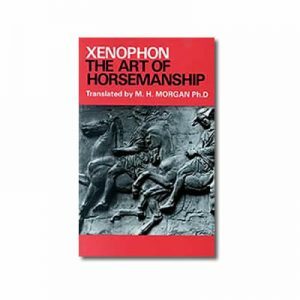 Because they had been so thorough on their ground work, it’s really where I’d want every horsemanship class to be able to start off. 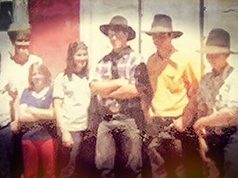 Because, a lot of times, even though I might be doing a regular horsemanship class, I’ve got to go back and say, ‘Listen you guys, we’ve got to go back and talk about all the stuff you missed. 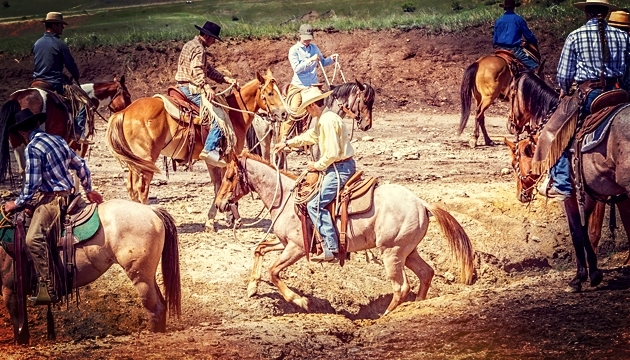 You don’t even really have good control of your horses from the ground- and then that’s going to have a whole lot to do with how much or how little control you have when you’re on their back. So, they really gave me something to work with. I enjoyed doing it. 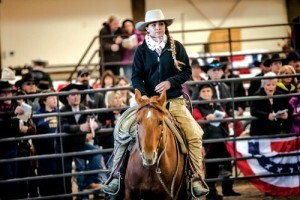 “To me, the true legacy of this kind of horsemanship is to get it out there like that—have people like Reata, and some of the people who are going to school there with her, that is the next generation and they’re making it happen. It’s cool. Reata Brannaman. Photo by Melanie Elzinga. David Gamble was asked by Reata to be MSU’s judge for the competition. 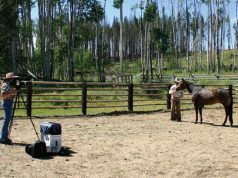 David is not a teacher at MSU but rather is a horsemanship clinician who teaches public and private clinics in Montana and around the country. 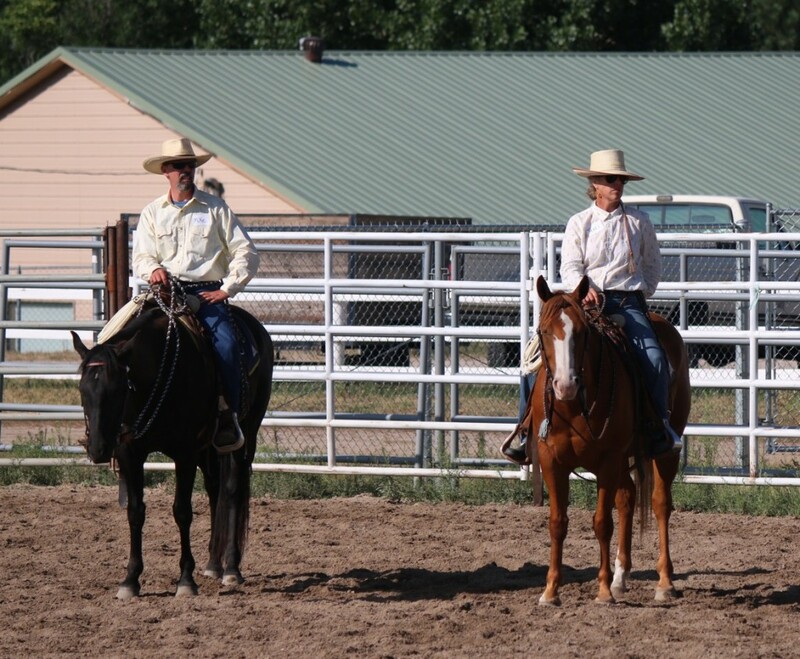 UMW’s judge was Margaret Hebel who heads up the Draft Horse Driving Club on campus in Dillon, Montana. 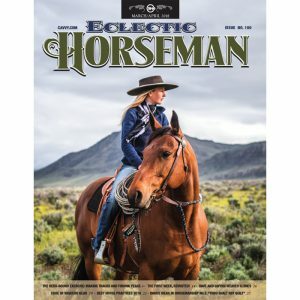 UMW offers the nation’s only four year degree in Natural Horsemanship, according to their website, and the program’s lead instructor is Eric Hoffman. David says he was surprised and humbled to be asked to be one of two judges at the sale competition, which is set up to be between the two schools. David clearly was moved by what the students from both schools had done with their horses. “I told them that in my opinion they all had done an exceptional job with the colts,” David says. “They all picked up their leads. They all were happy. They all were willing to stop. They were all trying to turn with the best of the students’ ability. They were all willing to deal with the tarp. They were all opening the gate fine. They all drug the log just fine. I actually got very choked up. Making friends at the sale. Photo by Melanie Elzinga. Technically, UMW students won the competition, coming out on top in terms of points. But, David stresses that the points the students earned were meaningless in light of how wonderfully relaxed and capable all the colts were who competed, showing that every student had done an excellent job. The Top Hand award went to Isaac Johnson of MSU. 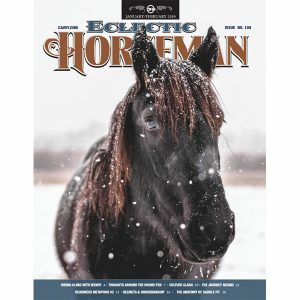 All the colts sold the next day during the online auction with the top selling horse bringing $12,500, and the average sale price per horse coming in at $4010. 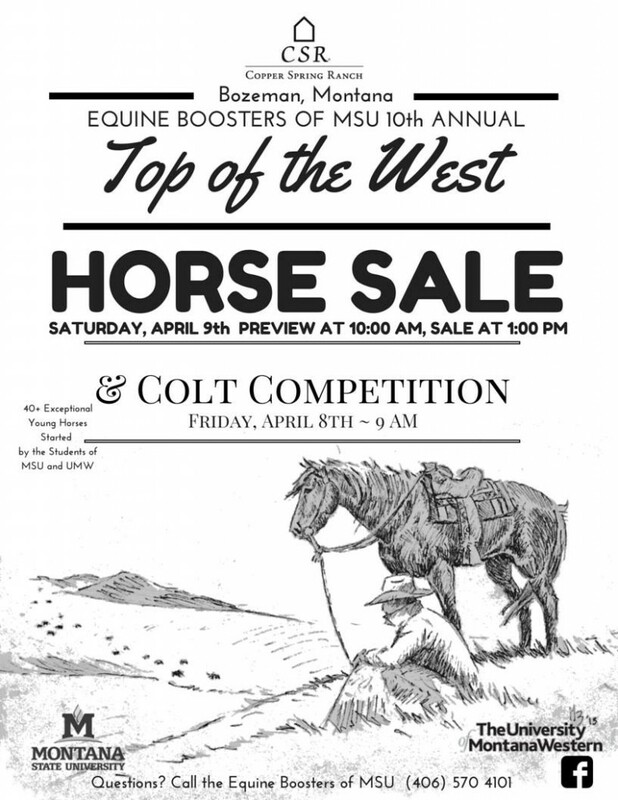 A video of the sale and a sale catalog can be viewed online at the MSU Equine Boosters website: www.equineboostersofmsu.com. The sale made more than $120,000 for the MSU and UMW equine programs. The dedication of the students to the horses they are assigned at both schools seems to go above and beyond the call of curriculum and duty. David’s praise for these college programs, students, and horses clearly is heartfelt. It also is his belief that the kind of horsemanship Ray Hunt sought to take to the world is getting traction in these college curriculums. “What we all believe in,” David says, “and what we strive to do with our horses—to better ourselves—is really coming through in a younger generation. I’m 55 years old and so to watch these kids that are half of my age, to watch them what they’re doing and to know they all have a journey in mind to stay in the horse world…some of those kids I’d take right away to go to work! Reata points out that this year’s sale was an improvement over those of the past. That is a trend they plan to continue. 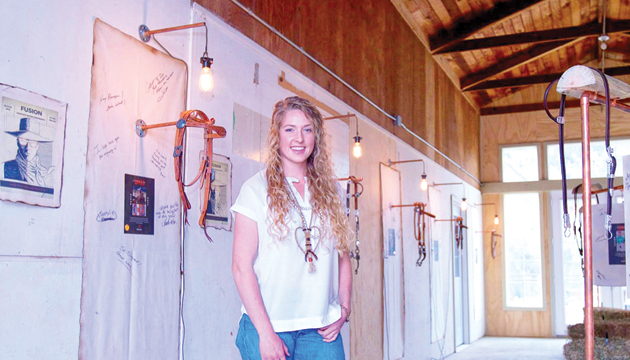 “Our goal for years to come is, we’re going to try to improve not only the quality of horses but the education and the opportunities the students have to teach those horses,” she says. “Right now we’re in the process of finding colts for next year so we are ready for all those students. MSU currently is looking for horses for the upcoming year. 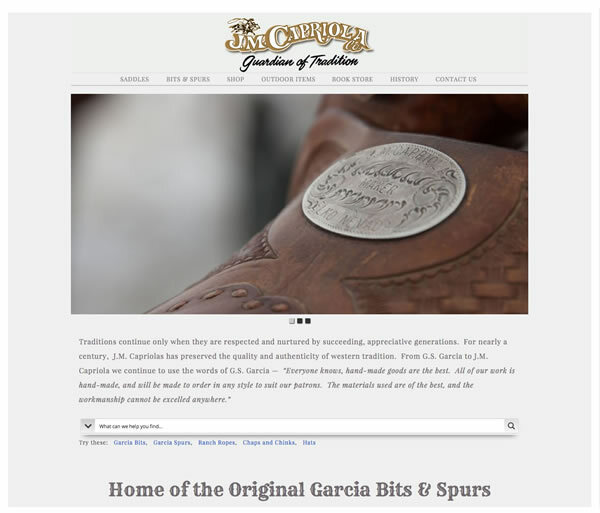 This year, they will be able to purchase some horses along with accepting donated horses. 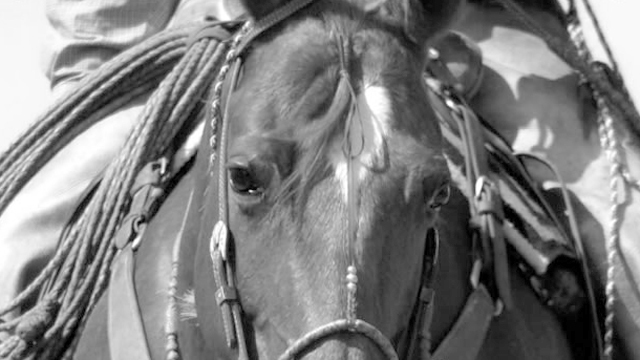 Reata says that any leads on horses for the program are greatly appreciated. Donated horses can be used as a tax write-off for the amount that they bring at the sale, Reata explains. If you would like to donate a horse to the MSU program, e-mail Reata at: reatabrannaman@gmail.com. 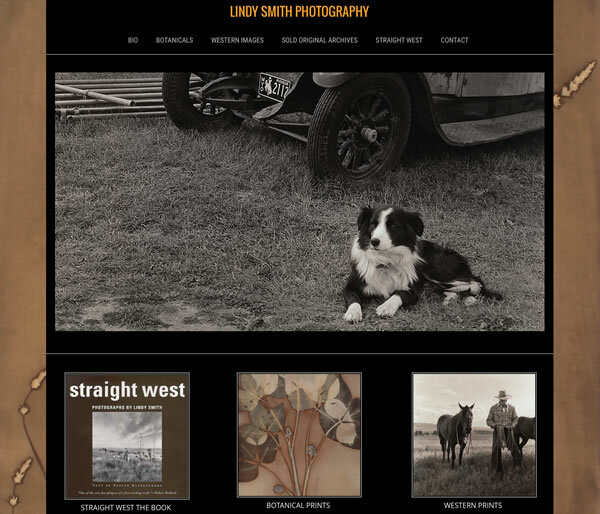 Mike Lupow and Terry Murray are a married couple with a sheep ranch in Peyton, Colorado. 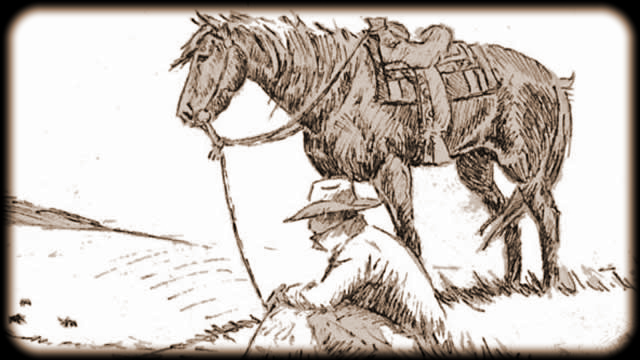 They were looking for a couple of horses to have on their place and heard about the Top of the West Horse Sale and decided to go to see if they might find two horses that would work for them. Mike and Terry brought home two three-year-old mares that they purchased from the sale. They have a sheep operation, but they say the horses mainly are for pleasure—and they have been a real pleasure so far. 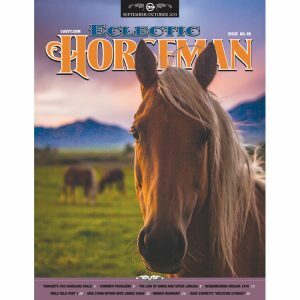 Visit www.equineboostersofmsu.com for more information. 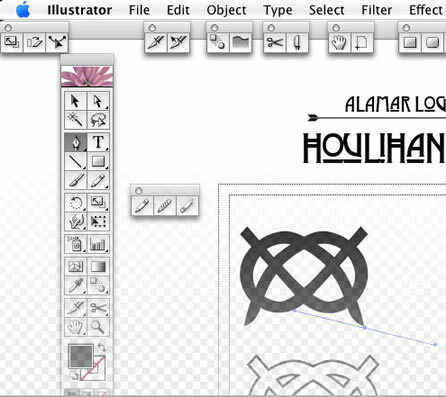 Next articleComparable Parts No. 6 – Quit ribbing me!